Zimbabwean President Robert Mugabe assumed the chairmanship of COMESA from Kenya’s Mwai Kibaki Zambian Chronicle has learnt. COMESA is in the process of creating a customs union for economic integration and free movement of people among member states. 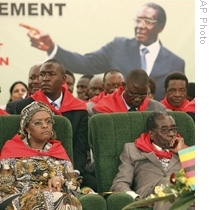 Speaking at the 13th COMESA summit held at Victoria Falls in Zimbabwe where the customs Union will be launched, Mr. Mugabe said member states must speed up the process of generating their own capital instead of relying on donor funds. Mr. Mugabe also said COMESA must develop its infrastructure and negotiate better deals with the World Trade Organization. He was speaking at the official opening of the COMESA summit of heads of state and Government as he accepted the chairmanship of the trade organization. Meanwhile Ugandan President Yoweri Museveni said COMESA must find best ways to survive the current global economic crisis. Mr. Museveni said COMESA must take advantage of the global recession to face economic challenges with confidence. Meanwhile, Auditor General, Anna Chifungula says the probe which was initially scheduled for completion on June 15, may drag on to the month end. Ms. Chifungula said a number of files are not easily accessible because three other investigative wings are relying on documents required for the audits. Forensic audits into the K27 billion scam at the ministry of health may not be completed on schedule because a number of files are being shared among three other investigative wings. And Ms. Chifungula said she will consult the Ministry of Finance on the possibility of engaging additional forensic auditors to probe other ministries. She said some co-operating partners have offered to assist in engaging more forensic auditors for broad based probes. Ms. Chifungula said there is also a possibility of hiring private forensic auditors locally. The Auditors are currently conducting forensic audits at the Ministry of health where over 32 civil servants linked to the scam are on forced leave.